Both camera uses same 16.1 megapixel High-Speed Live MOS Sensor and Olympus’ TruePic VI image-processing engine. Both camera features sensor-shift type 5-Axis Image Stabilization , the 5 Axis stands for camera shake on 5 separate axes: yaw, pitch, roll, vertical shift and a horizontal shift. Both camera uses Frequency Acceleration Sensor Technology (F.A.S.T.) AF in Single, Continuous and Tracking modes is available for high speed autofocus. Olympus E-M5 shitter speed is limited to 1/4000. Olympus E-M5 video is limited to 30fps at Full HD mode, with Olympus E-M5 you can shoot Full HD at 60fps. The new Olympus E-P5 have big 3.0-inch tilting monitor. Approx. 1,036,800 dots LCD capacitive touchscreen, better than the E-P5. E-P5 is the world’s first mirrorless camera equipped with a 1/8000 sec. high-speed mechanical shutter , WiFi introduced in PEN Series with E-P5, you can share your videos and images with smart devices and you also have in-built GPS for geo-tagging of your images. If you are willing to purchase a new Micro-Four Third Mirrorless camera, E-P5 is the best choice, but for Olympus E-M5 users I will not recommend to update your camera. 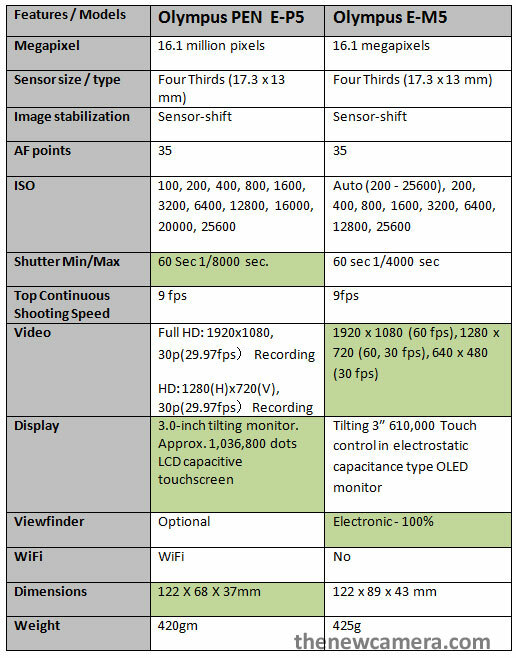 Since camera features almost same core specification.